Our hand saw is used to cut areas that are inaccessible by the road saw and up to a depth of than 150mm. Our ring saw is used to cut areas that are inaccessible by the road saw and hand saw but require sawing to a depth greater than. These saws are commonly use in ventilation ducts, window penetrations, doorways, swimming pools, planter boxes, and garage slabs. 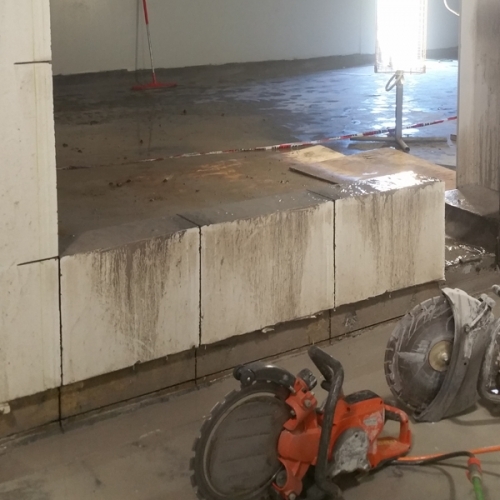 Handheld cutting up to 270mm depth in floors or walls. Petrol and hydraulic system available. Handheld machinery means it can be used in multiple situations. Great for cutting existing paving and brickwork out of older buildings. We are equipped for commercial, industrial and residential concrete cutting and drilling. Locally owned and operated. I consent to Inland Concrete Cutting collecting my details through this form.